If you had a blur in the middle of your vision and could only use the sides of your vision, would that influence your life? In short, that is what Stargardt's Disease1 is, it's an eye defect that affects approximately between 3'000 to 4'000 people living in South Africa. This genetic degeneration of the central vision of the eye can cause eventual complete to near-complete loss of vision - thus they have trouble reading, trouble recognising people and colours and will never be able to drive a motor vehicle. Currently, no cure is available for Stargardt's Disease. The only vision that eventually remains, is peripheral vision - what you and I see out of the side of our eyes. 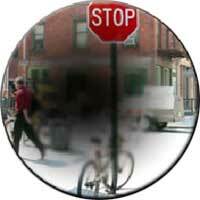 The macular is the central part of the retina where the information that we see or observe is collected and is then sent to the brain to be processed or interpreted. Because the percentage of people that suffer from this disease is low (1:10'000 = 0.01%), compared to other illnesses like cancer or HIV, the funding for research is very low and there is almost no hope for people suffering from it. Due to the fact that the cause for the macular degeneration hasn't really been established, it makes the task even more difficult. The disease is affects more people over the age of 55 - the age for the start of braincells to start normal degeneration. In the case of Stargardt's Disease, this degeneration starts as early as the age between 5 and 20. There is an electronic magnifying glass that can be connected to a computer that magnifies the text/writing (58x). It costs approximately R28'000! There is also an electronic pocket magnifying glass (10x - 14x), the size of a cellular phone and is ideal to take along to class. It prices anything between R7'000 and R14'000! Youth @ HEART in conjunction with Afrikaanse Hoër Meisies School, is currently busy with a fund raiser for these electronic devices. Financial contributions can be made directly to the school. The school's contact number is 012-344-3811/2, choose option "finance", or ask to speak to Miss Marie Pienaar.